The Scrovegni Chapel [tskroh-VEH-nyeeh] is a true masterpiece, located among the ruins of the ancient Arena of Padua. As for its exterior, it is nothing exceptional. It’s a teeny chapel, built between 1303 and 1305, as part of a sumptuous palace that once was in this area, property of Enrico Scrovegni, hence the name. The real highlights of the Scrovegni Chapel are the frescoes by Giotto. He painted the entire surface with precise decorative and symbolic project, grounded on the theme of salvation. Since the chapel pictures were not allowed at the time of my last visit, in this post I am attaching Wikipedia photos. On the side walls: Stories of Joachim and Anna (the parents of the Virgin), the Virgin and Christ (38 panels). At the bottom of the side walls: monochromatic allegories of Vices (Despair, Envy, Infidelity, Injustice, Wrath, Inconstancy, Foolishness) and Virtues (Hope, Faith, Charity, Justice, Temperance, Fortitude, Prudence), facing each other. On the wall of the former entrance door (opposite to the current entrance): the Last Judgement. On the top there’s Jesus with patriarchs, angels, archangels and apostles. On the centre of the scene there are: to the left the blessed ones, to right the damned, devoured by Lucifer or tortured by other devils (there is a man on a spit, one that is sawn in two, a man hanged by his tongue… I leave you the “pleasure” to discover the others by yourselves). At the bottom, under the cross, the client Enrico Scrovegni offers a model of the chapel to the Virgin and two saints. 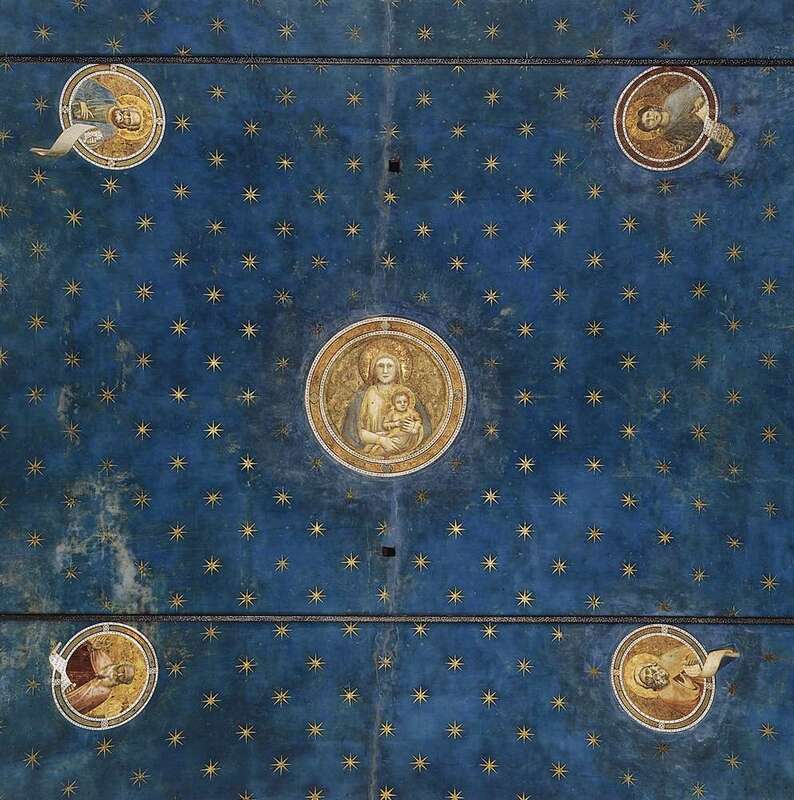 Everything is crowned by the vault, decorated with eight-pointed stars on a ultramarine blue sky (colour that symbolizes the divine wisdom). Compared to the Stories of St. Francis in Assisi, Giotto shows greater maturity and mastery of painting. In the human figures feelings and passions are vividly represented. The architectures are more realistic, anticipating the discovery of perspective of the fifteenth century. Reginaldo Scrovegni, deceased father of the client, was a usurer. Even Dante Alighieri mentions him in his “Inferno”. His son Enrico decided to build the chapel to ask God forgiveness for his father’s sins. In The Adoration of the Magi panel you can see the star of Bethlehem passing over the hut. Well, Giotto used as a model the Halley’s Comet he had observed in 1301. The seats of the city tram are decorated with the motif of the eight-pointed stars on ultramarine blue, recalling the Scrovegni Chapel’s vault frescoes. The Massacre of the Innocents panel shows a group of mothers desperate for the fate of their children. It was only thanks to the last restoration (ended in 2002) that the tears on the mothers faces have re-emerged. These are the first tears shown in the history of painting. I booked online the day before the visit, choosing the time slot and then paying by credit card. The next day I went to the Ticket Office one hour before the visit, with the printed receipt. After leaving my bag at the cloakroom (for free), I spent the next 50 minutes in the multimedia room where a nice lady explained to me and to other tourists some details about the frescoes. It was very interesting and allowed me to appreciate more the visit. When the time to get in arrived, after a stop at the toilets (very clean), I went to the chapel. It is necessary to seat in the compensation room for 15 minutes (watching an informative video), to stabilize the internal micro-climate, in order not to damage the frescoes. Only then you enter the chapel and you can stay there for 15 minutes. I had already seen the chapel twice, before the last restoration. I already thought that it was beautiful. But now, after seeing it restored, I think it’s a marvel. The frescoes are unique. I especially loved the Last Judgement and its grotesque figures. But the thing that most impressed me was the blue colour, a wonderful spiritual blue that you can not forget. It is definitely worth a visit. It not possible to reserve for the same day in which you intend to visit the Chapel. You can not bring pets, bags, food and drinks inside the Chapel. Getting there from the train station Walk along the avenue towards the city centre (leaving the train station façade behind you). Stay on the left side of the road. Past the bridge and continue straight ahead. You will walk along the perimeter of the public gardens and then you will spot the Roman Arena ruins. Follow the inclination of the Arena walls. After the bend to the left, you will see a church on the right. Left of the church you will find the Eremitani Museum Entrance (which is also the Scrovegni Chapel entrance). I entered the Chapel of Giotto, where the whole vault and the backgrounds of the frescoes are so turquoise to make believe that the radiant day had, too, crossed the threshold with the visitor.